This week’s Gallery Prompt at from the lovely Tara over at Sticky Fingers is The Girls. This is my entry. My mum and I don’t have the best relationship, in fact she normally says I’m the mum and she’s the daughter, which is the case. She has been through a lot in her life and things didn’t work out the way she wanted them to be. She is a great grandmother to my boys, is a crazy cat lady and my mum. 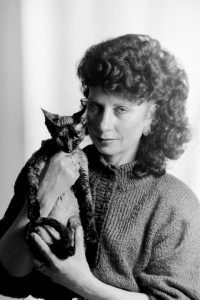 This is my mum and a cat called Star which she had back then. It’s about 15 years ago. 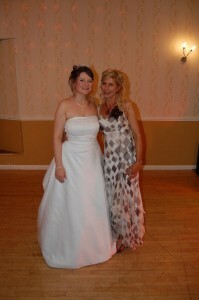 This is my mum and I on my wedding day at the reception. Aww, the picture on your wedding day is just gorgeous! And, Star is just well, a star! She is beautiful! A Devon? she looks just like Cheryl. Was she super silky too? Goodness the cat looks fierce! Great photo though! Looking gorgeous on your wedding day!These are great pictures, the cat picture is so striking, we always used to have cats growing up, big hairy moggies though!